Drizzle bottom of each serving plate with 1 tsp (5 mL)of flaxseed oil and balsamic vinegar. In a medium bowl, combine cooked brown rice and flaxseed. Add egg and milk, beat with a fork until well mixed. Add cheese, onion, celery, basil, salt and pepper. Set aside. Remove and finely chop stems from mushroom caps. Add chopped stems to rice mixture. Place mushroom caps, tops down, into a 9 inch (22 cm) pie plate that has been sprayed with a nonstick cooking spray. Evenly divide rice mixture onto mushroom caps. Loosely cover with foil wrap. Bake 40 to 45 minutes until mixture is set. Let cool 5 minutes. Drizzle bottom of each serving plate with 1 tsp (5 mL) of flaxseed oil and balsamic vinegar. Place mushroom cap on each plate and serve. Serving Size: 1 mushroom. Each serving contains 1 tsp (5 mL) of whole flaxseed and 1 tsp (5 mL) of flaxseed oil. 1 cup cooked brown rice2 Tbsp whole flaxseed 1 egg1/4 cup 2% milk1/2 cup grated cheddar cheese1/4 cup finely chopped onion1/4 cup finely chopped celery1/2 tsp crushed basil1/4 tsp seasoned saltpinch black pepper3 portobella mushrooms, (4 inches) in diameter 1 Tbsp flaxseed oil1 Tbsp balsamic vinegarInstrucions:Preheat oven to 350°F (180°C).In a medium bowl, combine cooked brown rice and flaxseed. Add egg and milk, beat with a fork until well mixed. Add cheese, onion, celery, basil, salt and pepper. Set aside.Remove and finely chop stems from mushroom caps. Add chopped stems to rice mixture.Place mushroom caps, tops down, into a 9 inch pie plate that has been sprayed with a nonstick cooking spray. Evenly divide rice mixture onto mushroom caps. Loosely cover with foil wrap.Bake 40 to 45 minutes until mixture is set. Let cool 5 minutes.Drizzle bottom of each serving plate with 1 tsp of flaxseed oil and balsamic vinegar. 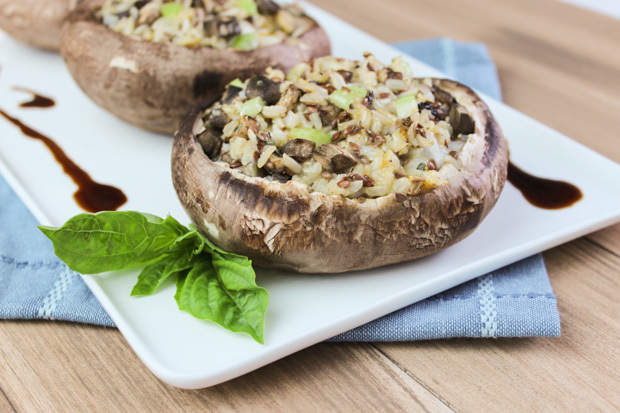 Place mushroom cap on each plate and serve.Yield: 3 servings.Serving Size: 1 mushroom. Each serving contains 1 tsp of whole flaxseed and 1 tsp of flaxseed oil.